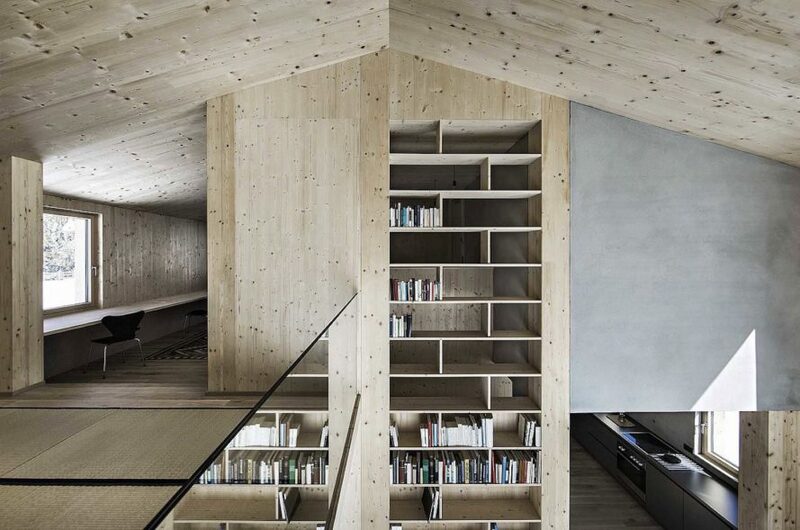 When clients approached LP Architektur to commission a rural retreat, the architects responded with a cozy cabin that puts a modern spin on Austria’s traditional cabin design. Completed after ten months of construction, the holiday retreat is elevated on a slope set at the edge of the Embach mountain village in Austria. The gabled cabin is clad in rough-sawn timber for a rustic look that will develop a natural patina over time. The EFH Hochleitner cabin was designed to blend into the landscape and the surrounding rural architecture. Thus, the 105-square-meter building sports a farmhouse-like gabled roof and rough-sawn timber cladding punctuated by a few differently sized windows. Its position on a slope affords the home views across the village and mountains. The interior is similarly minimalist in design, however, has a distinctly modern edge thanks to clean lines and choice of furnishings. The home is arranged around a centrally located staircase illuminated by an angled skylight. Natural light pours into all parts of the home through large windows and reflects off the light timber surfaces that make up the walls, ceilings, and furnishings. The timber, rugs, and pops of color from furnishings give the interior a cozy feel. When clients approached design studio LP Architektur with a commission for a rural retreat, the architects responded with a cozy cabin that put a modern spin on Austria’s traditional cabin design. Completed after ten months of construction, the holiday retreat is elevated on a slope set at the edge of the Embach mountain village in Austria. The gabled cabin is clad in rough-sawn timber for a rustic look that will develop a natural patina over time. 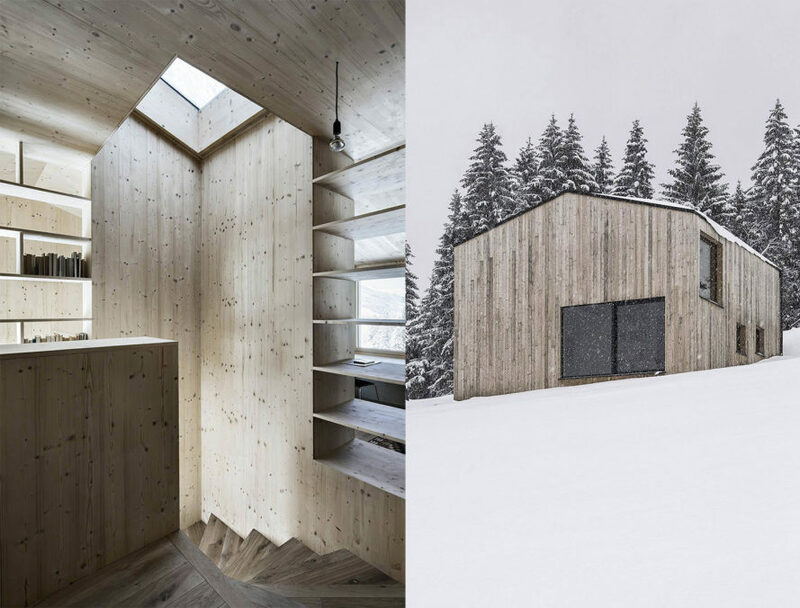 The EFH Hochleitner cabin was designed to blend into the landscape and the surrounding rural architecture. Thus, the 105-square-meter building sports a farmhouse-like gabled roof and rough-sawn timber cladding punctuated by a few differently sized windows. Its position on a slope affords the home views across the village and mountains. The home is arranged around a centrally located staircase illuminated by an angled skylight. The interior is similarly minimalist in design, however, has a distinctly modern edge thanks to clean lines and choice of furnishings. Natural light pours into all parts of the home through large windows and reflects off the light timber surfaces that make up the walls, ceilings, and furnishings.